The Andromeda Galaxy, M31, was probably one of the first galaxies you ever saw first-hand. It was mine. That was all way back in 1969. Since then, I have grown to appreciate it as far more than just the ill-defined oval blur I drew in my logbook. But in 1969, the thought of looking for individual objects within M31 never crossed my mind. Above: Early evening December star map from Star Watch by Phil Harrington. 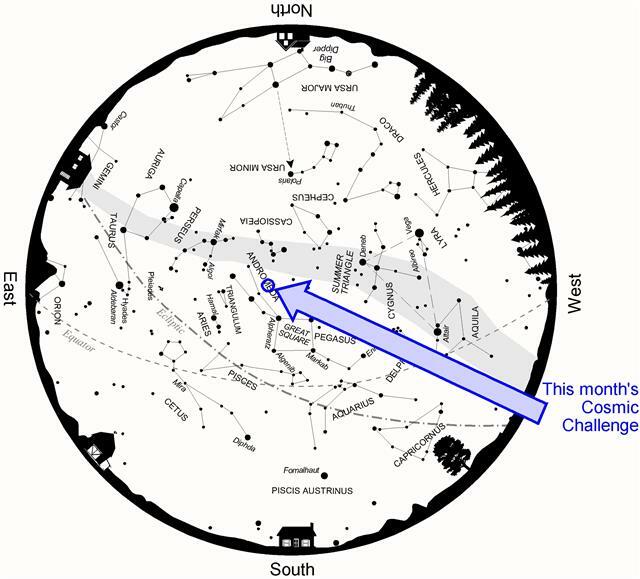 Above: Photographic finder chart for this month's Cosmic Challenge. Image of M31 by Kevin Dixon, www.magnificentheavens.com. That changed in 1984, when Arizona astronomer Brian Skiff penned an article in the Fall '84 Deep Sky magazine. His article, simply titled "All About M31," included details for viewing many of that galaxy's open and globular star clusters. Skiff noted that a total of 355 globular clusters were identified as gravitationally bound to M31 in Paul Hodge's seminal work Atlas of the Andromeda Galaxy. Published three years earlier by the University of Washington Press, the atlas is long out of print. Thanks to the Internet and the charitable graces of its author, however, it remains available today via the NASA/IPAC Extragalactic Database (NED). In the ensuing years, another 150-plus members have been added to the M31 globular family. In this challenge, we will look at some of the brightest. The table below, listing most that are brighter than magnitude 15.5, makes a good jumping-off point for the task at hand. Note: "G" numbers are from the Hodge atlas. 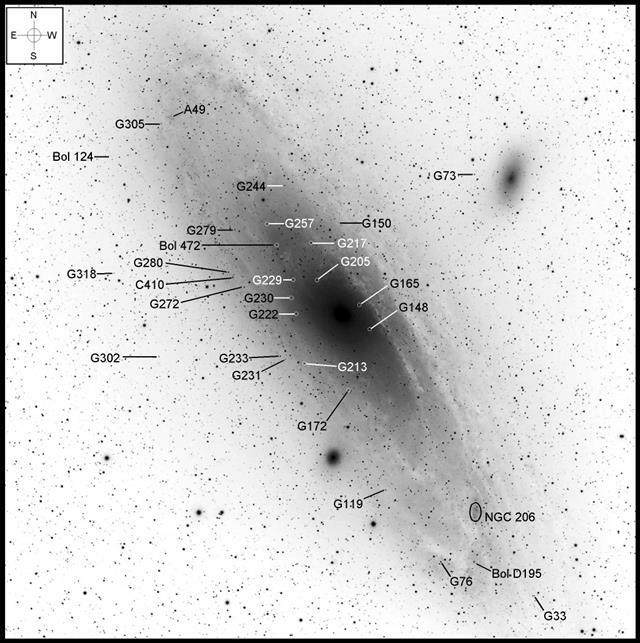 "Bol" refers to entries in the Revised Bologna Catalogue of M31 Globular Clusters and Candidates. Of the globulars in the table, the brightest and largest by far is G001. Also known as Mayall II, G001 lies more than 2½° southwest of M31's central core. That proves a real blessing, since it removes its delicate glow from the galaxy's bright spiral-arm disk. Here's a great PDF chart for anyone starhopping their way to G001. First, locate 5.3-magnitude 32 Andromedae, which is 4° south-southwest of M31 and 1.6° due east of the cluster. Center on 32 Andromedae and then follow a crooked trail of six 7th- to 9th-magnitude stars westward to SAO 53990. G001 lies 13' further west, just south of a slender triangle of 13th-magnitude suns field stars. Two fainter stars stand guard on either side of the globular, one to the northwest and the other to the southwest. At first glance, it is easy to mistake all three for a tight triple star, but the globular is easily identifiable as nonstellar at magnifications above 250x. If you own a 10-inch (25cm) or larger scope, be sure to give it a go! Above: A sketch of G001 through the author's 18-inch (46cm) reflector. The remaining clusters in the table are far smaller than G001 and are superimposed somewhere on M31's disk, and so are difficult to see because of the low contrast. All require at least a 15-inch (38cm) and 300x before they appear nonstellar. Anything less and they remain as just faint anonymous "stars." Working eastward from G001, the next stop is G076. To find it, center on 7th-magnitude SAO 36585, positioned 14' southwest of M32. Sliding southwestward 13' puts a flattened obtuse triangle of 11th- and 12th-magnitude stars in view. G076 is just 40" southeast of the triangle's southernmost star, but take care not to confuse it for a faint Milky Way star that is settled a little farther southeast. G078 is about half a degree north of G076 and half a degree west of M31's bright core. Look for a slightly fuzzy, 14th-magnitude point 2' east-north of a north-south pair of 12th-magnitude stars. If you have success with G078, then try for G072, which is another 5.4' to the north-northwest. It's about half a magnitude fainter, however, so expect it to be a tougher catch. Some of the most challenging of M31's globulars nearly overlap the galaxy's central core. For instance, G213 is just 10' southeast of the core and is very nearly superimposed on the edge of the galaxy's halo. It lies just 1' west of an 11.5-magnitude star, but to isolate it from the bright surroundings, use the highest power you can muster. If G213 proves a little too tough, then try these next two. Although they also suffer the effects of the bright spiral-arm halo, both are better isolated for improved contrast. G272 lies just 1.3' southeast of an 11th-magnitude star that marks the pointy apex of an isosceles triangle of 9th- and 11th-magnitude stars 20' east-northeast of the galactic core. G280 is 4' east-northeast of the apex star. Do you also notice a very soft, elongated glow just to the southwest of G280? 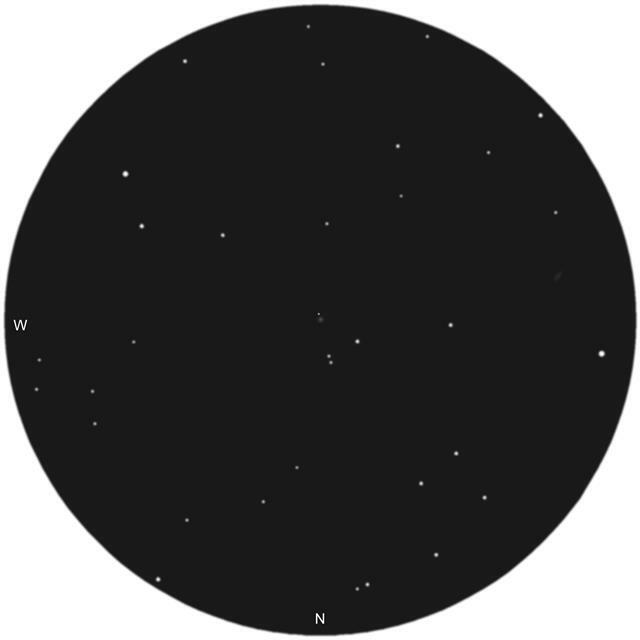 That's another bonus object, a large open cluster of stars listed as C410 in Hodge's atlas. The overall magnitude of this difficult object is 16.1, but its brightest stars are far too faint for amateur observation. Once you've picked off these highlighted globulars, why not go for even bigger game? Use the table and photographic chart to find as many those listed as you can. And then branch out. There have been several informative threads in the CN forums over the years. Here are but three: one, two, and three. Have a favorite challenge object of your own? I'd love to hear about it, as well as how you did with this month's test. Post your thoughts in this e-column's discussion forum or contact me through my web site. Till next month (next year! ), remember, half of the fun is the thrill of the hunt. Game on! Very nicely written. I was lucky to find a second hand copy of your book as amazon didn't have any new ones. A cracking exercise, that will be undertaken, getting all the objects done for my scope range. Maybe even try some others. Thanks, both for the compliment about the article and for hunting down the book. The first printing sold out, and unfortunately Cambridge didn't do a second. Last year, they told me that they were planning on a second run in paperback with a few updated tables and finder charts. I produced those about 18 months ago, but still nothing from them. Not sure what their plans are at this point, but meanwhile I've posted the updated material on my web site so that readers such as yourself can at least take advantage of it. Follow this link. My copy's coming apart from use! ...meanwhile I've posted the updated material on my web site so that readers such as yourself can at least take advantage of it. Follow this link. Thanks so much for the updated material, Phil! I printed all but one of them and added them to my copy of your book. FYI... the link to the "Table 2.4 Dates of Vesta Oppositions 2018-2025" PDF isn't working. I've observed a number of M31's globular clusters. G1 is a relatively easy target. Thanks for the catch! Fixed now. Much obliged for the update. Will keep an a eye out on your site.